The market is segmented by Type (Commercial Aircraft, Military Aircraft, General Aviation) and Geography. Comes with 3 months of post-purchase analyst support. 80% of our clients seek made-to-order reports. How do you want us to tailor yours? 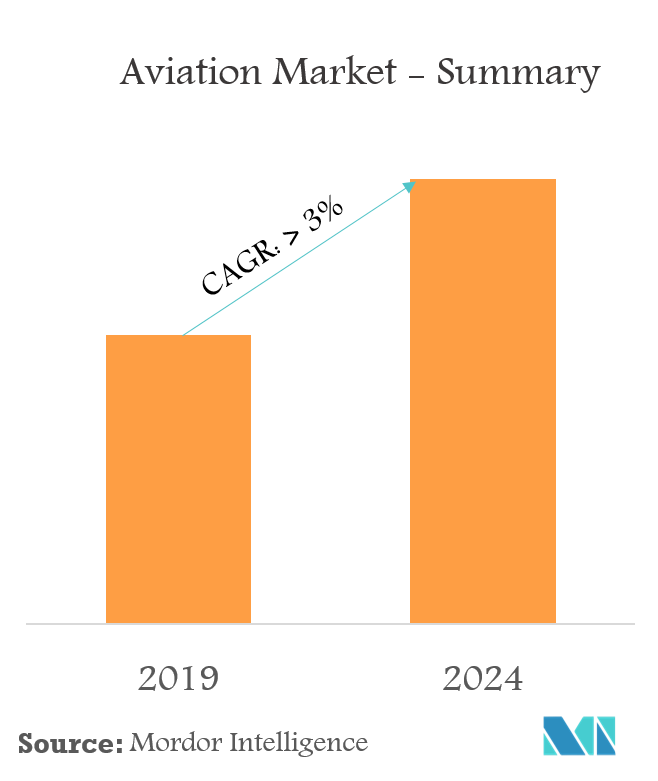 The aviation market is anticipated to register a CAGR of more than 3%, during the forecast period. Increasing defense expenditure, mostly from the developing countries, may drive the procurement of military aircraft, thereby propelling the growth of the aviation market in the coming years. Lower air fares, growing living standards, and a growing middle-class in large, emerging markets, like China and India, are the hmajor contributors to increased air travel. This has made the airlines operating in the regions to establish new routes and serve more passengers, by procuring new aircraft, thereby adding more seats. Replacement of aging commercial aircraft and the procurement of new generation commercial aircraft are the main factors driving the growth of the market. Report scope can be customized per your requirements. Click here. In 2018, North America accounted for the highest market share across all the regions in the world. The revenues from the region are predominantly due to the United States, which has the highest aircraft fleet in the world. North America iswas followed closely by Asia-Pacifc, in terms of revenue share, in 2018. 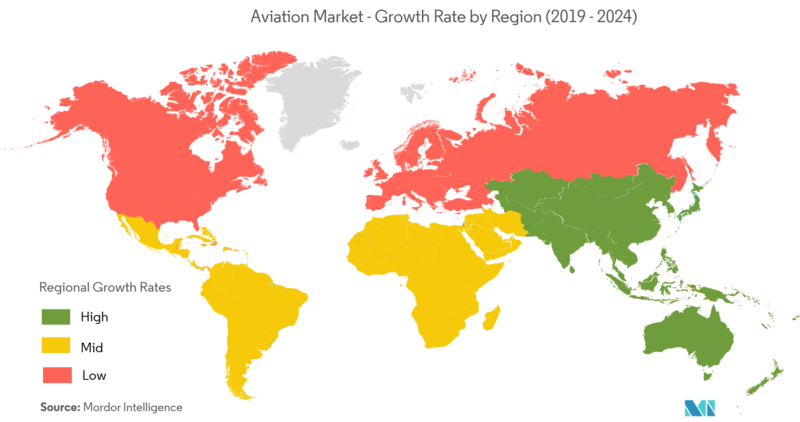 Revenues from Asia-Pacific are projected to grow with a high growth rate, during the foecast period, as the emerging economies in the region, like India and China, are experiencing a huge surge in their respective aviation markets, due to an increased demand for air travel in the countries. The commercial aircraft segment dominates the aviation market, accounting for more than half of the market revenues, as of 2018. The commercial segment is expected to continue to dominate the market during the forecast period, due to the rising demand for new aircraft to cater to the increasing air travel. Additionally, several airlines are replacing their ageing fleet with newer generation fuel-efficient aircraft. The military aircraft segment is anticipated to grow, however, slower than the commercial aircraft segment, as most of the new aircraft order finalizations for the military take few years before getting the final approval for the procurement. The declining military expenditures from some countries also hampered the growth of the military aircraft segment, to some extent. 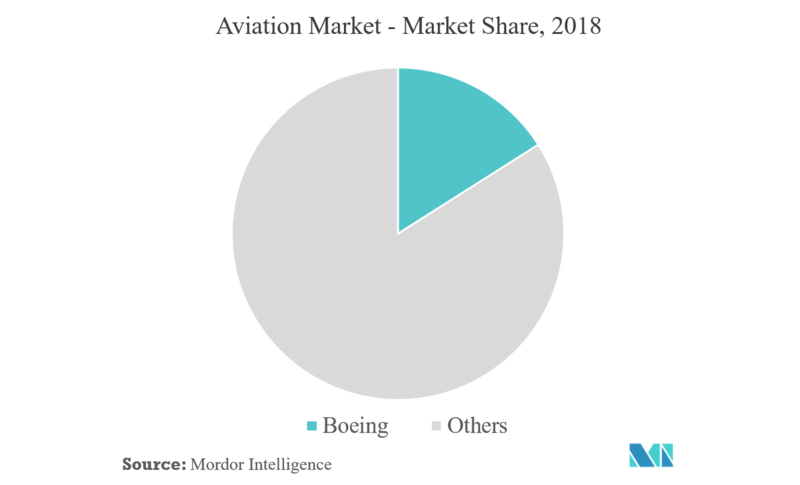 In the aviation market, four OEMs accounted for close to 60% of the market revenue share in 2018. Lockheed Martin, Boeing, Airbus, and Textron were the major share holdersn of the market revenue, in the aviation market. The rivalry between Boeing and Airbus continued, mainly in the commercial aviation sector. These two companies, along with Lockheed Martin, have maintained their market dominance for a little over a decade now. Commercial aviation is expected to see new innovations getting implemented in aircraft design, which are expected to change the meaning of safety, comfort, and efficiency for, both, passengers and commercial aircraft manufacturers, as per the records of the patent database. Companies are looking forward to grab the opportunities offered by the new technological innovations, thereby increasing their respective market shares. Download the market shares of key players in this industry. Please Enter a Valid Email ID! Please Enter a Valid Message!